The first choice was whether or not to use an agent. Of four boats polled everyone that used an agent had the Admeasurer out within 24 hours. One boat phoned their agent half an hour after Murray attended the office and was measured the same afternoon. By not using an agent you do not get a guaranteed appointment date, but you still have to stay waiting on the boat. They do not let you know in advance if they're not going to attend and when you phone the offiec they will just say they were too busy to come. We were bounced our first appointment date and the following daye were back to waiting between 08.30 - 13.00. The office said the admeasurer had left at 09.30, but he didn't turn up until 11.45. We had found on another boat at 10.00 and he said he would be an hour but still didn't turn up for another 2 hours. We checked with the boat he had gone to before us and they had booked after we did, but via an agent. We are here at a quiet time, so do not know if you get bumped off the list time and time again as new people arrive and appoint an agent. So the first advantage is that the Admeasurer's office will give appointments to boats that use an agent within 24 hours. The other thing an agent does for you is arranging the appointment in the first place. If you are doing this yourself you are not allowed to make it by telephone, even though their own paperwork says to phone - you have to go to their office. Shelter Bay Marina runs a great bus service and the driver will drop you at the main Port entrance. You then check in with security, walk all the way to the end with the sea on your right and the pile of containers on your left. The control tower is surrounded by chain link fence and you have to wedge yourself through the locked vehicle gates. Then you have to go to the centre of the building (like a garage), round to the left is a lift and stairs and you go up to the first floor. Then the Admeasurer's office has a big sign on the door. You need your boat papers, crew list (passport details) boat papers and current clearance, the same as for a normal clearance procedure. They also ask you your boat speed and Canal Authority speak for 6 knots is Ocho! The buffer payment of $891 for <50foot boats is not payable if you use an agent (again checked with a number of boats). Ropes and tyre fenders are easily hired from an agent and delivered promptly on the day of your choice at $15 per line and $3 per fender. These are meant to be available for the Admeasurer, but they aren't checked. You then need to find line-handlers and yachts normally help each other. Shelter Bay Marina has a notice board for this and you need to ask around. Professional line-handlers can easily be hired from an agent and prices vary from £30 to £75 per day per handler. We have been unable to find any boat in either direction who did the transit in less than 2 days. The only things the Admeasurer really checked was the lenght under 50 ft, the presence of a fog horn (not tested) and the presence of a toilet seat! He then gave us a form stating the boat may not be up to standard. As far as we could tell, everyone gets this disclaimer form. After all this Murray bumped into an agent and hired the line-handler on the spot, with the agent agreeing to make the transit schedule phone call. Individuals have to wait until 6.00pm to make the call, but the agent had the confirmation earlier, indicating agents get first choice of slots too. We had hoped for a transit on the Monday, but ended up with a Thursday evening slot. Our line-handler - Javier - arrived at mid-day and we left the Marina at 15.00 as although our transit time was 17.30 he advised they can turn up early. We both felt confident and happy with our line-handler from the start. 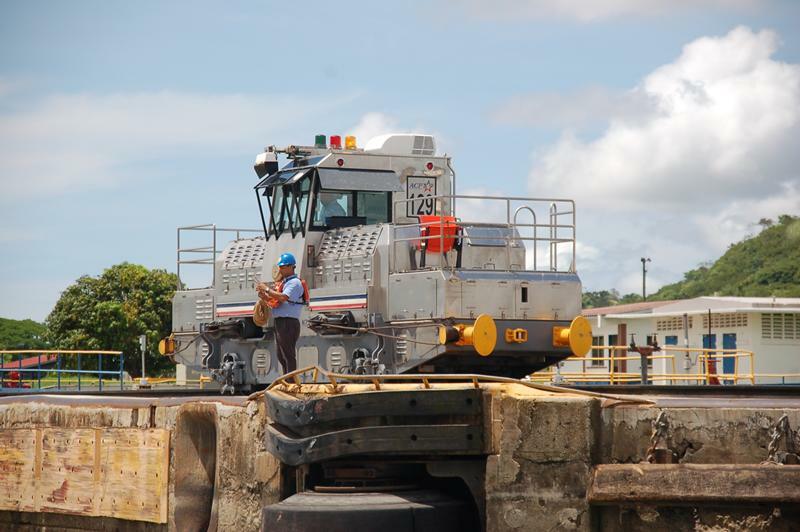 Our Advisor turned up eventually at 18.15 and we were to be rafted up to a Cat (who stole our fuel slot, but that's another story)By 20.10 we were in the Gatun lock, being towed by the Cat as the bigger boat is always given control. The Cat skipper was doing the maneuvering and he was a bit all over the place. Once we were secured by ropes he was obviously very stressed as he checked the spring lines about 6 times, undoing them and redoing them to exactly the same place. 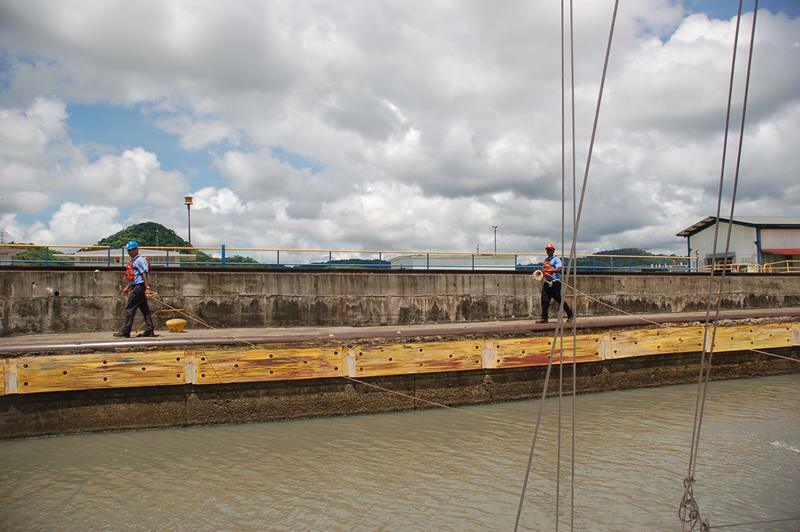 The first three locks at Gatun take us up an incredible 84 feet. It is very strangfe to be able to look down on where we were less than an hour ago. We are now off to tthe lake for an overnight stay on a buoy. Caroline has to cook a meal for 6 and the adviser wants his quickly as he will shortly be picked up by the tug. As always on any voyage Caz has prepared the first meal before departing so by 21.30 we are all eating. We had a poor nights sleep, to be woken at 04.30 by the howler monkeys. Everyone on our boat was up at 05.00 as the advisors regularly arrive earlier than the planned 06.30-07.00. Our advisor was no exception, arriving at 05.45. None of the Cat crew were up and we had to bang on their boat to get them to wake up. The lady owner got up, came on deck and scowled at us all. Once we pointed out their advisor had arrived their was a massive panic on their boat getting everyone up. Caz did the first bit of helming while Murray cooked breakfast. We did 4.5 knots as requested by the advisor who then said we could put up a sail to get another 0.5 knots. Caz explained that this wouldn't work, as we were heading into wind, but that our engine was capable of doing this. We trhen did 6 knots to the next lock to the delight of our advisor who hadn't realised we could achieve this speed. The advisors are pleased when any yacht can do 5-6 knots. It is only if you do less than 4 knots that you will be turned back. The rafting to the Cat was done under way and the Cat skipper obviously had no experience of this as both times he turned left away from us. The second time he was in danger of turning both boats right round with only one rope attached. Murray had to get his advisor to stop him from turning. 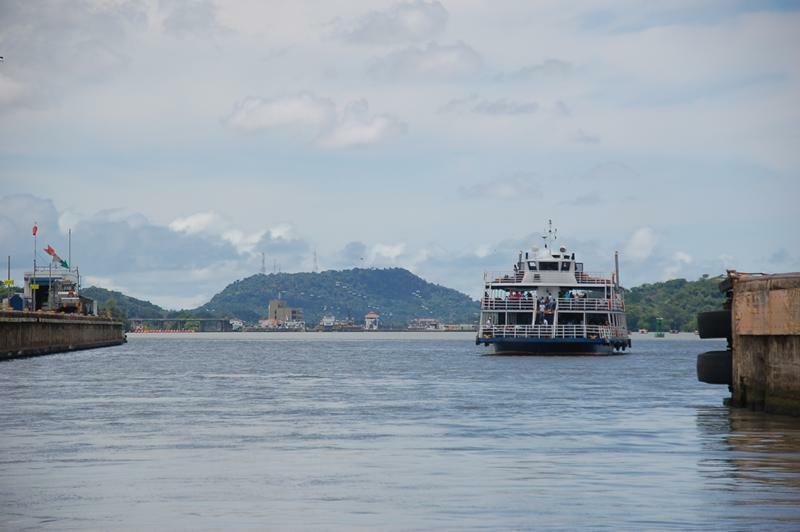 Then we were down, through one lock and still rafted to the final two locks at Miraflores where there was just our two boats with an audience of tourists and the web-cam. It was all over by mid-day with the advisor picked up at 5 knots and the line-handlers, lines and tyres dropped off at Balboa Yacht Club pontoon. The professional line-handler made all our radio calls, showed the other line-handlers what to do, controlled one line and caught the monkeys fist for the aft line, as well as taking our rubbish and sorting out the lines and tyre-fenders at the end. He was worth every penny and the tip elicited a grateful bear-hug in return. There were no real problems, though our boat was a bit overloaded and felt very empty when we went from 6 people to 2. The Monkey's Fists really whizz over the boat, but once attached you just gently motor into position with the canal line handlers walking the ropes down into the lock. The advisors talk through every step for everyone and we found both of ours to be very professional. Your boat does not have to be able to do 8 knots, they are perfectly happy with 5-6 knots and everyone gets the form stating their boat might not be suitable for the transit. The only part we can't confirm is whether there is an additional fee (as Murray was told in the Admeasurer's Office) if you declare less than 8 knots to the Admeasurer. (Mainly because no-one risked doing so - it's reported to be $800). 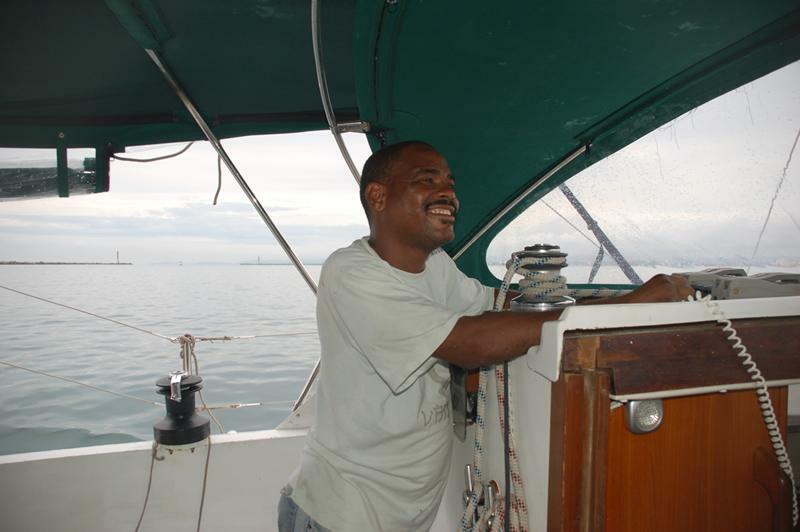 Addendum: We have now spoken with a boat who declared 6 knots and they DID NOT have to pay any additional fee. 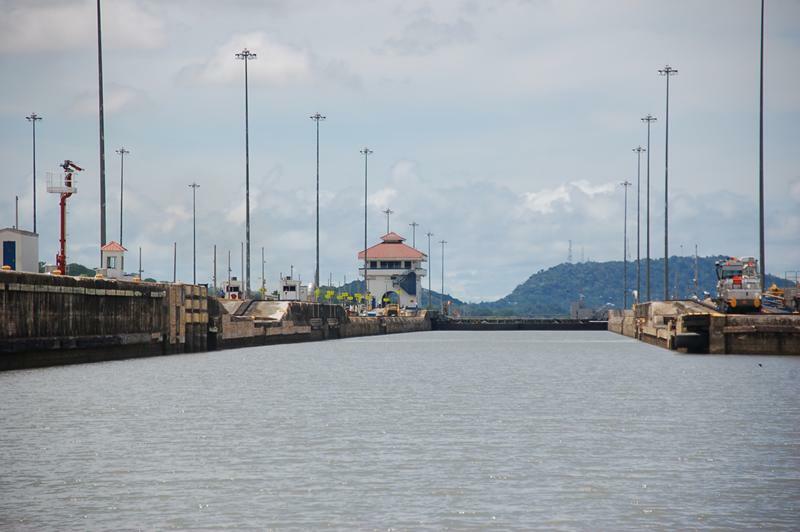 The Panama Canal is a magnificent piece of engineering that has worked continuously since 1914. 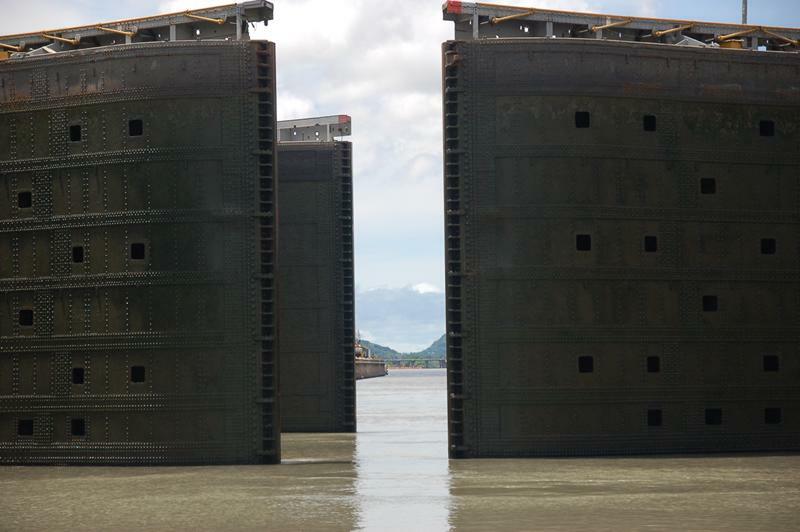 Now they are building another set of locks to take the supersize cargo vessels as at 1150 feet long the current chambers are too small.